I can't wait to see this in v0.5! Seeing this makes me just so excited to find out that you took the challenge to try to make this a reality! :D Keep it up dude! 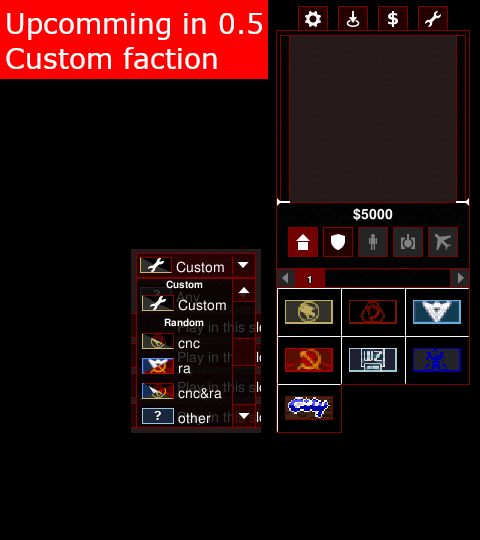 the last thing thats missing regarding the Custom faction are the prerequisites, these are a challenge. Reason for example are units like Soviet Shok trooper which require a Tesla Coil to be able to build them. As you can choose each Queue you might not get a Tesla Coil, thats the point. Tesla tank --> Same as Shock troop. Those are just Ideas, plus the only units I know that have a defense required to build them. The "Custom" faction will be able to choose each queue once while playing. There are some balancing restrictions such as: Alpha & SimCity dont get Aircrafts and SimCity does not get to choose a defence queue. If SimCity could choose a defence queue, the Custom faction would be a better SimCity then SimCity itself.